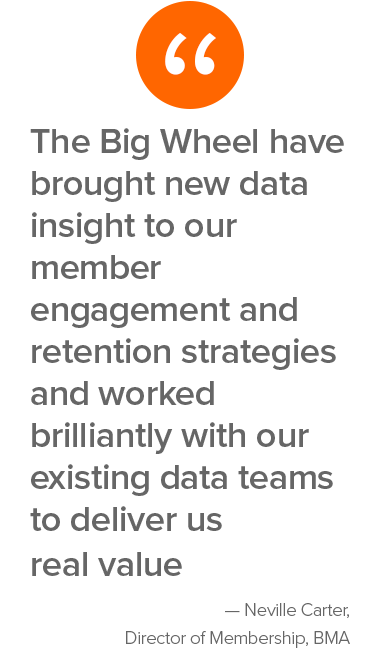 The Big Wheel Consultancy was founded in 2014 to provide specialist strategic consultancy and data services to organisations seeking to maximise their recurring revenues. Our very first client was the Telegraph Media Group who remain a client to this day. We continue to have a strong client base in media and are proud to now have clients across sectors including membership organisations, not-for-profit, software providers and business service companies. Julian Thorne is the Founder & Owner of The Big Wheel Consultancy. Julian has spent his whole career building large recurring revenue businesses. His very first job was as a Graduate Trainee Subscriptions Manager for Auto Express magazine and he has been hooked on the recurring revenue model ever since. Julian has a deep understanding of recurring revenue theory and how it applies to successful strategies. He takes real pleasure from sharing his experience with The Big Wheel’s clients and helping them succeed. Dave is Partner and Principal Data Consultant at The Big Wheel Consultancy. Dave has over 15 years’ experience working with data and analytics for recurring revenue businesses. Dave's expertise includes churn analysis, propensity modelling, data analysis, lifetime value analysis, business intelligence reporting and building bespoke customer data models for clients. If you’ve got a recurring revenue business model and even a very modest amount of data Dave will help you uncover valuable data insights quickly. Associate Director at Iris Concise, a global marketing consultancy. The Big Wheel Consultancy Limited Registered Office: 8th Floor Anchorage House, 2 Clove Crescent, East India Dock, London E14 2BE. Company Number 08829688.